Working in high-end residential homes, we offer interior and architectural design to clients across London. From start to finish, and with the support of our sister companies Tiptoe Builders and Tiptoe Carpentry, we provide everything from architectural design to planning, construction to joinery all the way through to the finishes, fixtures and furnishings. If you would like to find out more about our services please contact us. Providing design, construction and joinery, we completely revamped this four bedroom home from top to bottom. 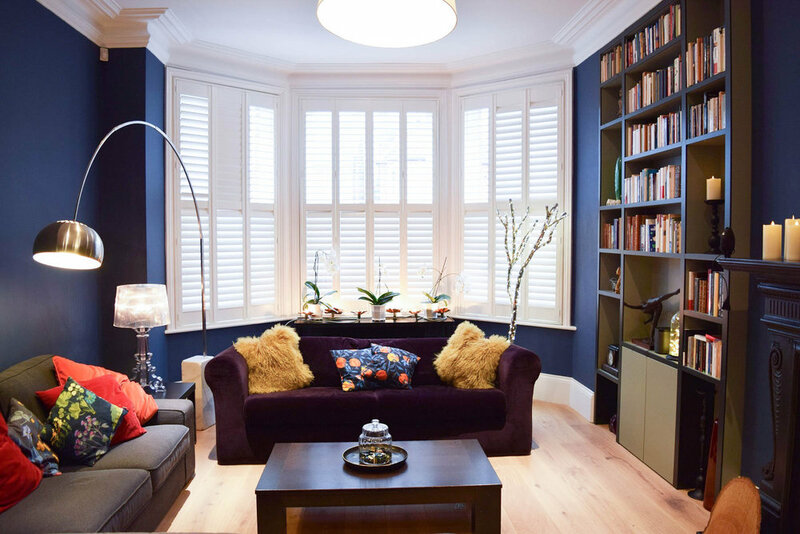 The extensive list of works included: converting a garage into a children's playroom, creating a utility room, installation of classic oak flooring throughout and transforming an outdated staircase and balustrade into a feature of the home. We provided architectural and interior design, construction and joinery services to turn this well lived in 4000sqft Victorian home into a vibrant, modern, functional family home with unique personal touches throughout. We created new rooms, built a large extension, reconfigured the loft space to create two rooms and a bathroom, repositioned, renovated and extended the staircase and created bespoke joinery throughout. We sourced all fixtures, fittings, furnishes and equipment from UK and international suppliers. 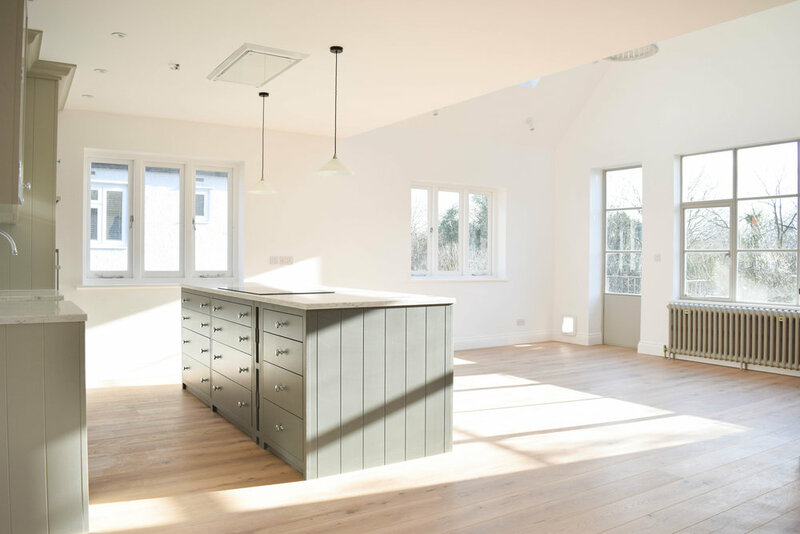 We transformed this three bed, one bath, first floor maisonette into a two floor, four bed, two bathroom family home including vaulted living spaces, a hand crafted bench, traditional kitchen and bespoke joinery throughout. The main focus of the home is the handcrafted kitchen and open dining space. Designed and built by us, the oak veneer kitchen integrates Neff and Miele appliances . The ceiling was opened up to reveal original beams and roof lights were installed to complete this open, airy family living space. At Tiptoe Design we want to help you realise your home's potential. Whether you require architectural design and construction or simply a refresh to your home's interior, you will be part of the process from start to finish, and it begins with a meeting in your home. At the meeting we will discuss your ideas, explain how we work and make some initial design suggestions. We will then come back to you with a detailed proposal tailored to your needs. This may include a measured survey, design proposals, mood board, specification of materials and sample selections. Once approved, we will project manage your project, ensuring that every stage is done with precision and care. Our aim is to provide you with memorable, creative design solutions that will make your home stand out from the rest. Amelie has a deep passion for interior design. Born in Sweden, she studied interior design in at the prestigious Boulle School of Design (École Boulle) in Paris, where she developed a taste for Parisian interiors. Her experience in France and Sweden has developed her eclectic, international style and maintains a strong connection to her Scandinavian roots. She spent her time in Paris working in commercial design, before spending the next ten years working with Luxury brand, Baccarat. She now lives in London with her husband and three children. Amelie comes from an artistic family; her sister and cousin are also designers, and is related to pioneer abstract painter, Hilma af Klint. Scottish born Mhairi studied interior design ad the Interior Design School in London and is now working on various projects across London. Following a successful work placement with Tiptoe Builders, Mhairi decided to join the design team and bring her keen eye for design to the company. Mhairi's previous career as a Purser on long haul flights allowed her to travel the world and develop a worldy, creative passion for interior design. She loves the words of William Morris, who was a leader in the English Arts and Crafts movement "Have nothing in your houses that you do not know to be useful, or believe to be beautiful." The founder of Tiptoe Builders, it has always been Cedric's dream to create a company that offers the total package: build and design. Born in France, he has lived on both sides of the world, and spent many years in Australia working on large construction projects before finally settling in the UK. He has a Masters in Sound and Vibrations, which makes him our in-house expert in soundproofing. His understanding of the technical constraints of building work together with his interest in design helps the team create end to end solutions that work effectively. Born and raised in London, Claire has been part of the Tiptoe team for nearly three years. Over that time she has worked closely with company Director, Cedric, to develop the face of the company, set up two new arms of Tiptoe (Carpentry and Design) and manage a number of home renovation projects. Over the years, Claire has worked for a number of companies across a multitude of sectors including home maintenance, not for profit, events, PR and technology, consulting on marketing and business development. Claire is heavily influenced by the styles of the 50s, 60s and 70s, from music all the way through to design. She is always looking for vintage styles to wear and rummaging through charity shops to find retro furniture and decorations. In the meantime, you will receive a message asking you to join our mailing list. We promise not to spam you, and will only send content that we think you will be interested in.